An early Christmas surprise came to the HHS Football team as Coach Earl Garcia announced the official return of Coach Dean Eychner and Coach Brian Emanuel to the Hillsborough High School coaching staff. For those of you who weren’t around in the mid-90s and early 2000s, you probably missed out on the biggest decade in HHS Football history. Dean Eychner, who served as the Defensive Coordinator for 17 years, was a powerhouse for the Terrier football program. Creating one of the most relentless defenses in Hillsborough County history. Eychner later pursued a Head Coaching position at Brandon High School where he remained for the past 5 years. 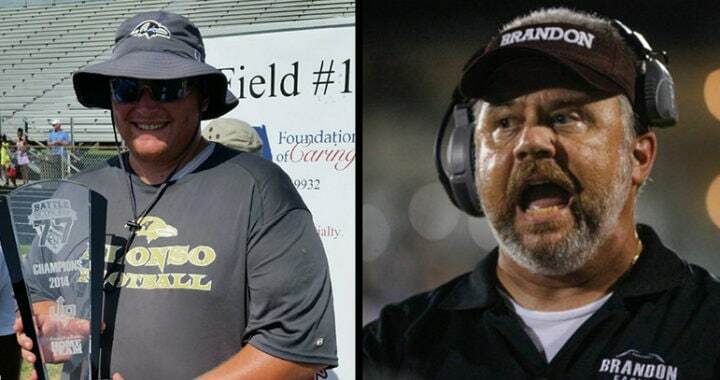 Brian Emanuel was the Offensive Line coach at HHS for over 7 years before leaving to pursue a Head Coach position at Alonso high school where he remained for the past 6 years. The addition of Eychner and Emanuel will put not 1, not 2…but FIVE prior Head Football Coaches on the HHS staff. Coach John Kelly (Strawberry Crest & Cambridge Christian), Coach Earl Garcia III (King), and Coach Alonzo Ashwood (Middleton) have all served as Head Football Coaches. With depth in experience and a host of prior Terrier athletes on the coaching staff, HHS Football looks to serve up another epic season in 2017. The rebuilding of an empire!